Arizona Greyhound Rescue is in constant need of foster homes for Tucson greyhounds while they await adoption. UPDATE: We have dogs coming in November! We need 5 foster families. AGR covers all medical expenses - we ask fosters to provide love, structure and food. Foster families need to be able to commit to taking their dog to one monthly meet and greet and other AGR functions. Fill out our online foster application now! NOTE! Arizona Greyhound Rescue does not currently adopt to of send foster dogs to homes where there are children under the age of 15 years. 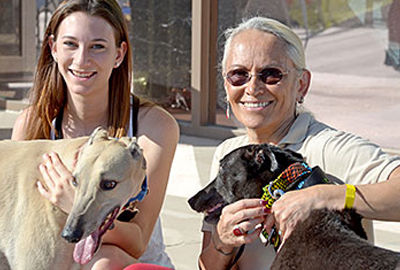 To give the greyhounds the best chance to be adopted, foster families must be local to the Tucson area. This gives potential adoptive families access to the foster dog through tabling events and other local arrangements. Imagine an adult dog that has never seen stairs or television or walked on tile. Imagine a dog that has never seen another dog breed or a cat or a teenager or a child. Greyhounds are that dog. Their racing lives are unlike other domesticated breeds, they don’t have early one-to-one contact with people. Most Greyhounds have lived their entire lives in a kennel situation and have no concept of what it’s like to live with a family in a house. Foster care givers can help ease the transition from the kennel to their forever home. Foster care can be as short as an overnight stay after a spay/neuter surgery to a longer term commitment that lasts until the dog gets adopted. AGR will be happy to work with you to meet your needs and match the best hound to your situation. Typically a hound is in foster care for 1 to 3 months. The requirements for a foster home are the same as for an adoptive home. AGR will make a home visit, where we will check for things like stairs, a fenced yard, the promise to provide indoor living space for the greyhound and that all other animals in the home are altered. AGR will provide all pre-approved medical care and support for you while the dog is being fostered in your home. We ask that the foster home provide a high quality dry kibble or we can subsidize. We also ask that the foster provides appropriate home training, a soft bed, and lots of love. Foster families are also responsible for transporting the foster dog to various meet-and-greet events in the area and toallow prospective adopters to visit the dog either at your home or in a mutually agreeable public space. The foster family’s input is very valuable in deciding whether the foster hound is the right choice for prospective adopters. If your situation doesn’t allow for adoption of a greyhound at this time in your life, please consider fostering instead. By getting a greyhound out of the kennel, you could be saving the life of a hound coming off the track with nowhere else to go. When your foster hound goes to a forever home, breathe a big sigh for doing a job well done, and then foster another one. Fostering is one of the greatest gifts you can give to a greyhound. Contact the foster coordinator or fill out our online foster application.